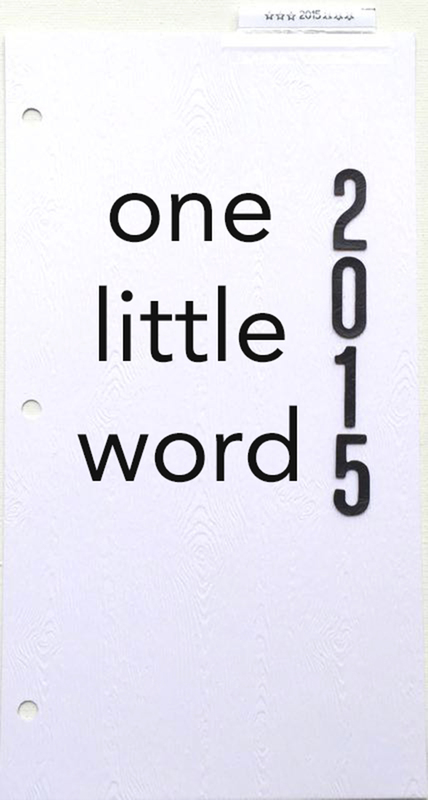 The One Little Word (OLW) project was started a few years ago by popular memory keeper, Ali Edwards. Instead of making New Years Resolutions she encourages you to choose a word that will help set an intention and tone for your year. This word has so many meanings and is my first non-literal word. It is metaphorical for so many things in life. 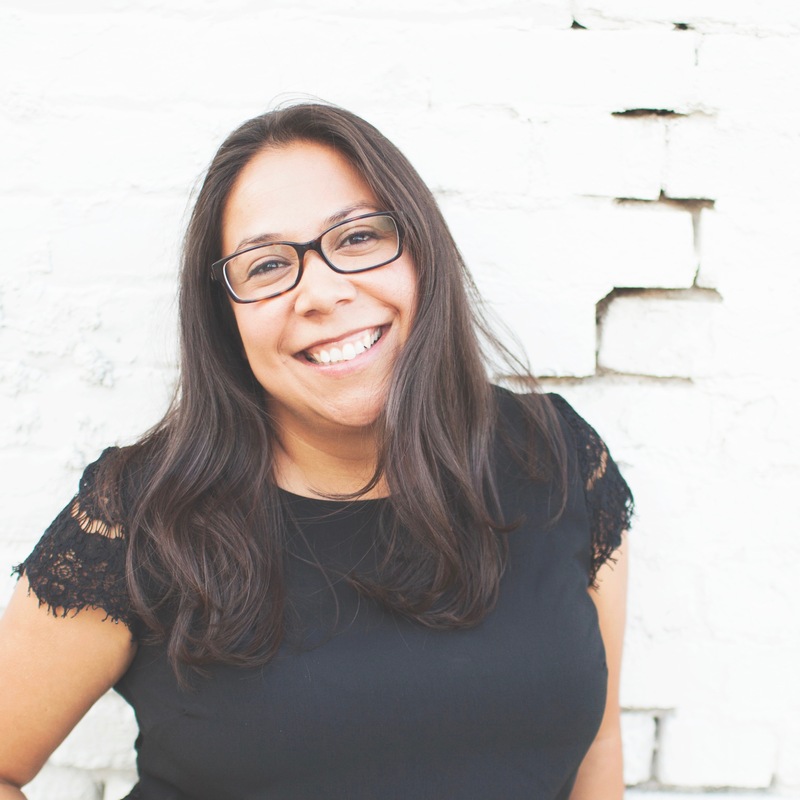 In Ali’s One Little Word class she provides some amazing prompts to help you really explore your desires and dreams for what your word can be in your life throughout the year. 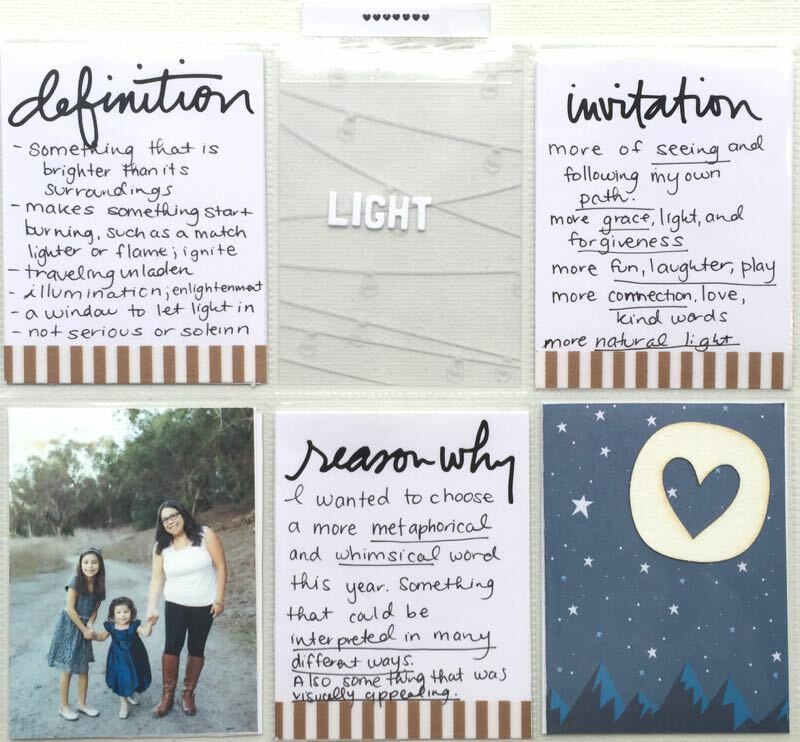 Using the January prompt I was able to expand on how I want “light” to work in my life this year. To shine a light on my creative style and vision through this blog and through my memory keeping hobby. To light a spiritual fire through mindfulness and yoga and to spread that light by my example and through my writing. To light a fire in our marriage and really deepen our connection emotionally, mentally, and physically, and spiritually. To be a light to friends and to continue building and strengthening friendships. To be lighter, feel lighter, look lighter by eating healthier, doing some light exercise, and losing some weight. To turn on my lightbulb and return to grad school. 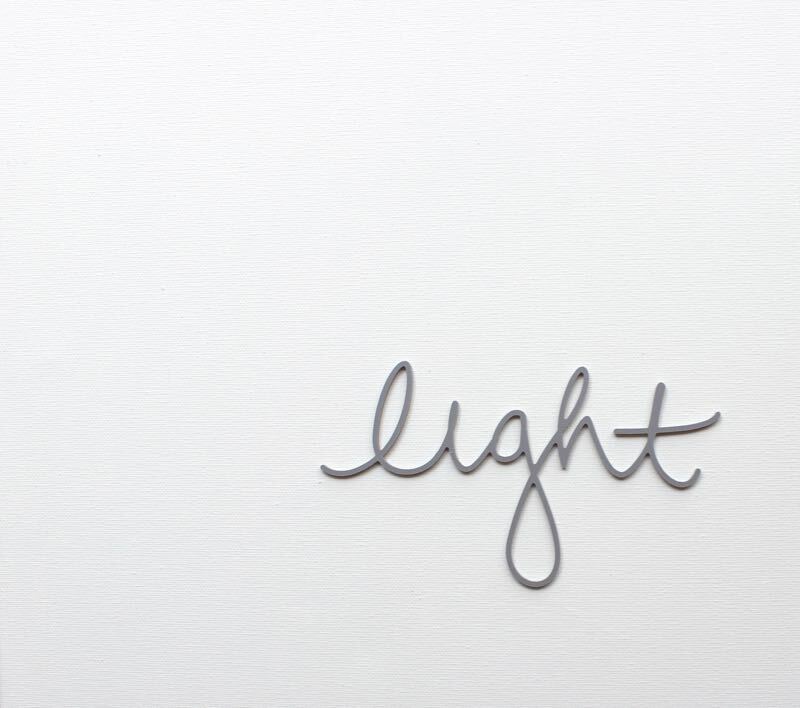 The quote above from Yogi Bhajan, “travel light, live light, spread the light, be the light,” was really inspirational for me and helped solidify “light” as my One Little Word for the year. I keep this quote close in my mind and have thought about it often as the year has progressed. It’s now June and I’ve had almost a full six months with this word and I think it was a really good choice. It adds a lightness to my mind whenever I think about it and has been integral in pushing me forward in so many areas of my life. This may be my favorite word yet! 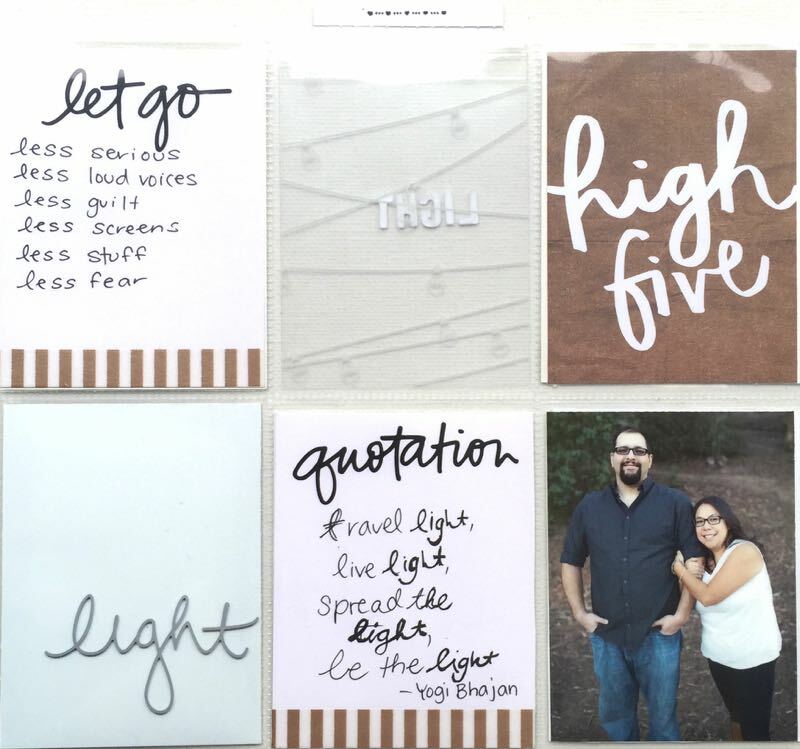 I’ll keep sharing my One Little Word journey using the monthly prompts. I’ll continue to share the visual reminders I see in everyday life over on Instagram. These small moments of mindfulness help keep my intentions for this word and for my life close in mind. 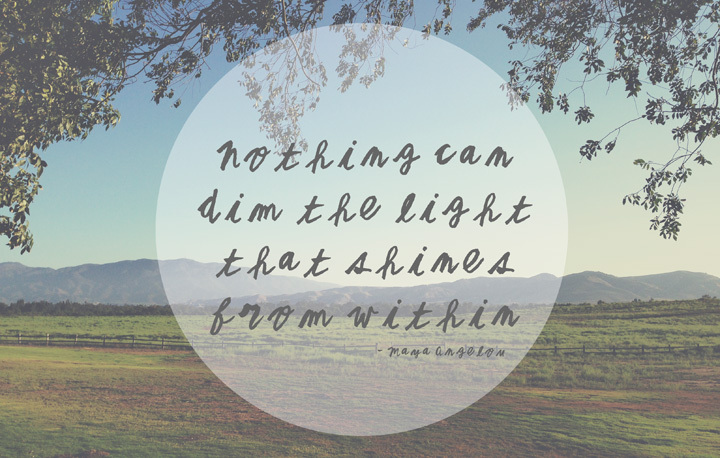 I’ll leave you with a “light” quote, from my One Little Word Pinterest board, I’ve shared here before. It is a quietly powerful mantra from a quietly powerful woman. Have you ever chosen a word to help guide your life? Is there a word that comes to mind that might help guide you through the second half of this year? Feel free to share in the comments. I am grateful for you. Thank you for spending a moment with me. I’ve been following along for some time and it wasn’t until this week that my word, “Focus” took on an even deeper meaning for my life. It will remain my word for the second half of this year. I do, however, like your idea of reevaluating at the six month point. This is so super cute. I love the theme throught the cards and photos. great layouts! Thank you for sharing. Thanks Mindy! It’s definitely one of my favorite projects each year. I love the combo of creativity and self-exploration. Thank you for bringing me into the world of one little word! Up until a couple of months ago I was on a winning streak in terms of living by my own one little word. Then life happened, and it took a back seat. So glad to have your words here inspire me to bribg my focus back to what’s important to me this year – purpose. I absolutely love this idea! I’ve been seeing it around alot lately and even though I’ve never gone out of my way to pick a word for my year, I also have been very aware that there is a word the is leading my year. This year it is “voice” and oh my goodness, the impact that it has had on my life has been crazy! Beautiful post! That’s amazing that you intuitively felt your word! “Voice” is a great one. Glad to hear that its had a big impact for you this year. Thank you for reading!